The Outlook PST Password recovery tool lets the users to restore Outlook password from PST files. This Outlook password decryptor cracks PST password and unlocks all the emails, tasks, contacts, calendars etc. It is compatible all the versions of Windows and widely supports all the versions of MS Outlook. Successfully recover PST password from Outlook in a click. Remove PST file password from encrypted files. No requirement of Outlook installation for PST password recovery. Safely stores decrypted passwords to a clipboard or a file. Unlock PST files of both ANSI and UNICODE type of any version of Outlook. Quick and swift password recovery from Outlook PST files. Demo version available for free trial. 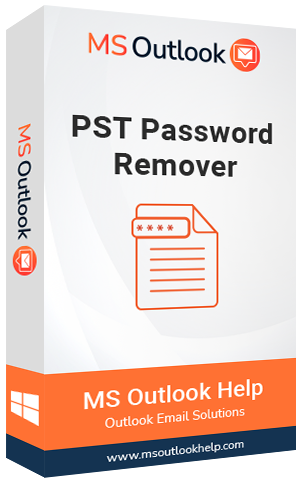 It is an efficient Outlook password recovery software that recovers lost password from all the mailbox items of Outlook such as emails, contacts, tasks, calendars etc. It restores any type of password irrespective of its length and complexity. 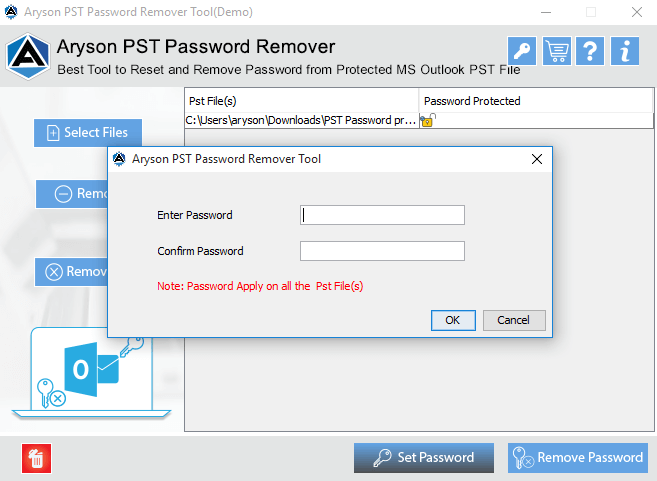 The PST password remover tool instantly recover Outlook password from PST in a click. Also, it keeps a focus on data i.e. no data loss occurs during recovery of lost passwords.It keeps the data remain intact. This Outlook password decryptor retrieves the encrypted passwords that are hidden. These password characters are hidden behind the asterisk (*) marks. You can see entire information about the PST file you’ve chosen i.e. file name, file size, file type etc. for password recovery. You just need to select the option “Get file information” in the software. You can crack PST password from Outlook data file and reset a new password using Outlook PST password remover tool. The Outlook password recovery tool saves the passwords that have been recovered in a separate file or to the system clipboard so that you’ll not lose them further. This software is having an easy to use and user- friendly interface. Any technical or non-technical user can easily recover Outlook password using this software tool. It doesn’t require any technical expertise. 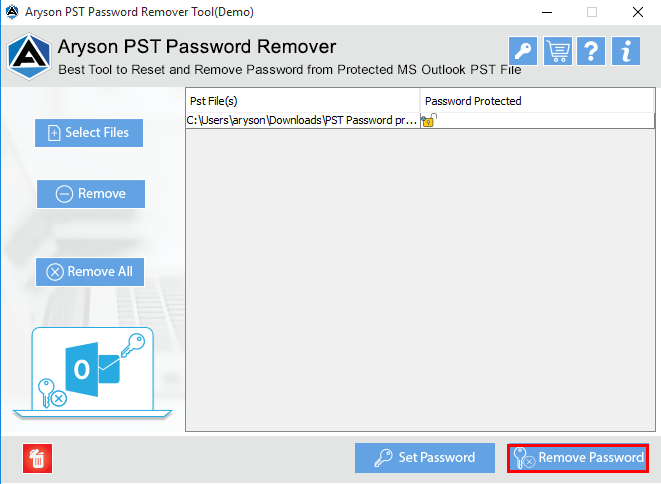 The PST password remover supports both the types of files i.e. UNICODE and ANSI. It recovers the lost password from these files without any hindrance. Also, it supports all the versions of Outlook including Outlook 2016, 2013 and 2010. It is compatible with all the versions of Windows OS. The Outlook password decryptor tool is available for free evaluation as a trial version. Using this tool, users can view first two characters of the recovered password. For viewing the full characters of password, you need to purchase the full version. Step 1: Launch MsOutlookHelp PST password remover software. Step 2: Hit a click on Open button to make selection of password protected PST file. Step 3: Now, click on the Recover button to retrieve password from Outlook PST. Step 4: Click on the button of Copy clipboard to save the restored password. Step 5: Exit the application by clicking on Close button.
" I got panicked when I forgot the password of PST file. I tried a few passwords, but my emails didn’t unlocked. Then, I used this PST password decryptor as suggested by one of my friends and it was really helpful." "It was very quick, easy and reliable password remover. I recovered very complex encrypted passwords of lengthy characters with ease." "I was very confused to opt this tool. But, i gave a try and the outcomes were quite surprising. It retrieved all my lost passwords with which I was struggling." How can I retrieve Outlook PST password? Follow these simple steps to restore lost password Outlook PST file. Run MsOutlookHelp Outlook password recovery software. Hit a click on "Open" button for making selection of .pst file. Now, Click on the button “Recover” to get back the password from PST file and to save them. Is it possible to unlock PST file in corrupted state using this tool? No, you can not recover PST password from corrupted PST file. Using this software, you can only restore passwords from normal PSTs. Does the tool requires Outlook for recovery of password? No, there is not any requirement of Microsoft Outlook for retrieval of password from PST files. Can I view the recovered password in the free version? No, the free version of software displays only first two characters of the recovered password. To view the entire password, you need to purchase the licensed version. Does the software saves the password at any location? Yes, the PST password remover saves the password in a particular file or to clipboard. A processor of pentium class. 20 MB space for installation of software. Disk Space - Enough for saving the recovered output. Operating System: Windows 10, 8.1, 8, 7 and other previous versions. Outlook: MS Outlook 2016, 2013, 2010 and other versions. This license is deliberately created for noncommercial use where a single person uses the software firmly. This license restricts the usage of the software for private home use. The software cannot be installed more than 2 computers which may be desktop or laptop. Software updates are freely provided to the user on a regular interval. A support team is always available round the clock for Personal License user to resolve any queries regarding the product. The standard license is meant to use in many circumstances. It could be used in business, corporate, government and academic platform. Upon purchasing the software, the user will be provided with business license version of the software which is assigned in the organization name given at the time of purchase. This kind of license has no limitations regarding the software usage. The software can be installed and run on several computers and thus allow simultaneous use of the software. Standard license users. The technical license is intended for the technical users who are looking for technical services which our software could deliver with other features as well. Under the technical license, the software product can be installed on several numbers of computers within a same geographical location where the software has been purchased. Additionally, this license provides users with unlimited access to data and files without any hassle. 24*7 tech supports is available for technical users who are facing issues related to the software product.